I’ll never forget the day I encountered “gourmet salt” at the store. I smirked. “GOURMET salt?” I giggled. “Who would be stupid enough to pay $10 for a container of salt, when you could pay 33 cents? Well, as it turned out, I was actually stupid enough to do that. I just didn’t know it yet. Sometimes I would go by the salt aisle, JUST to see if someone was there, about to be suckered into buying gleaming little pink crystals for 10 bucks. Most times, I ended up picking up a pack of those little buggers in my own hands and wondering why the heck I felt the urge to try them. Seriously. Twenty five dollars? It can’t be that good. But what if . . . what if it WAS? When I hear rave reviews about a local farmer’s market, or a new apple variety, or a local artisan honey that tastes just like local wildflowers . . . I just can’t help it. I have to try it. It calls to me like the whispers of valor and knighthood called to Don Quixote. I just . . . HAVE TO. Well as it happened rather nicely, I won a gift card at World Market by accidentally finding the seahorse (don’t ask), so huzzah! I could get my long-scrutinized, super expensive salt for free. So of COURSE I went right for the cream of the crop– the Fleur de Sel. “Flower of Salts,” the literal name of this crusty creature, is supposedly the best tasting salt in the world. Chefs the world over order this salt especially from France, most notably from Guérande– and this is the place of origin you want to see on your Fleur de Sel container, since there are cheaper, and less tasty, knock-offs. It is harvested by hand because it is too delicate to use a machine, as the crystals would be crushed. The salt is collected by ever so gently skimming the tops of the salt marshes– and the collection can happen only on a warm, sunny, low-wind day. The salt is sun-dried and then carefully packaged with plenty of space to avoid crushing. It carries with it the taste of the region– much like a fine wine or even local honey– and since it contains other minerals than simple sodium chloride, the taste is more complex than regular table salt. 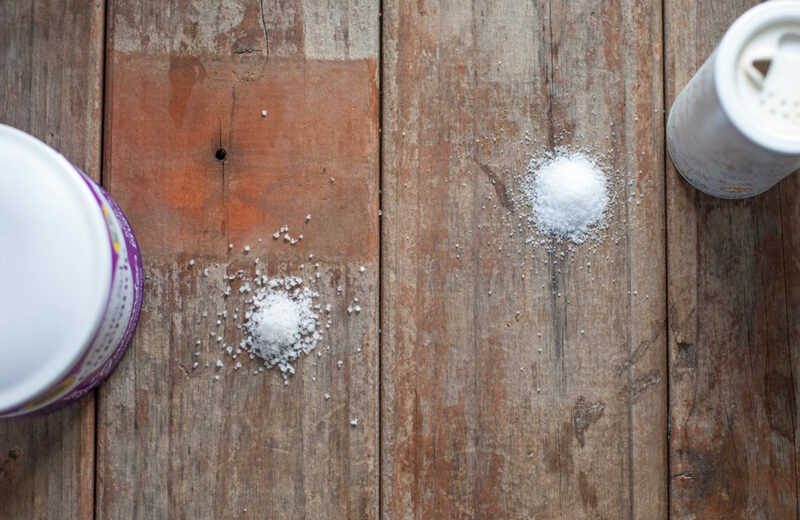 Fleur de Sel is what is called a “finishing salt,” which means that it is not used in cooking, but rather added after cooking, to add a little punch of flavor to meat, eggs, salads, desserts . . . anything, really. So I bought this fancy pants salt and took it home. Well, correction. The moment I got in the car I cracked it open to have a look. I half expected a little tiny choir to start singing the “Hallelujah Chorus” when I cracked the lid. But no. I was surprised by what I saw. 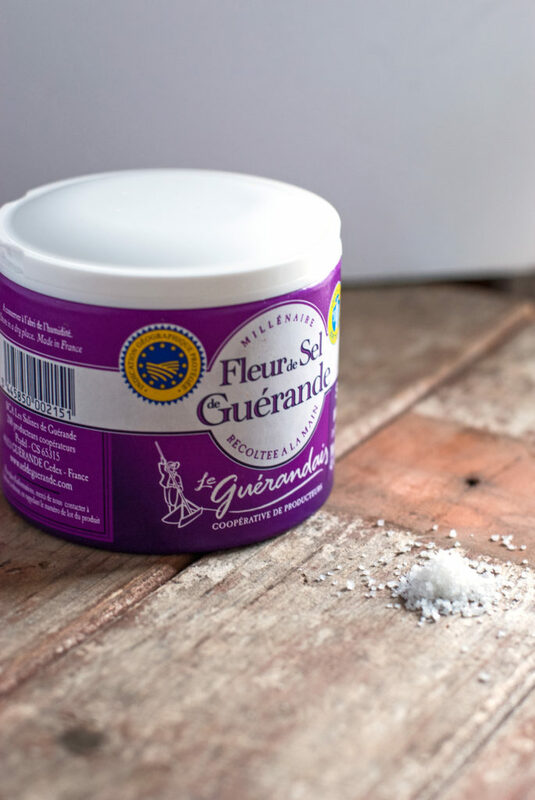 Fleur de Sel was not at all what I pictured (and unlike the other salt containers, this one was opaque to protect it from the light, so I couldn’t see the color of the actual granules until I purchased it). It was slightly gray– and looked a little bit clumpy, as if it were slightly damp. The crystals were not uniform in size or appearance. When I gently shook the container they didn’t shift much, as regular salt does. Weird, I thought. I dipped a finger in to taste. And my friends . . . I guess the little mini choir was in there, after all. Because they started singing to me. What does Fleur de Sel taste like? Hmm. That’s hard to explain. What does your first love feel like? What does it feel like to be young in the summertime, swinging your legs over the side of the pool, watching the sun go down, without a care in the world? What does it feel like to roll over, exhausted, and realize you have 3 more hours to sleep until you have to get up? The best I can describe it is to what it felt like, to me, to compare Fleur de Sel to regular salt. I took a few grains of regular old table salt, and sprinkled them on my tongue. You know . . . salty. Then I took a few precious grains of Fleur de Sel, and sprinkled those on my tongue. After tasting the expensive stuff, regular salt seemed so incredibly “chemical” tasting. It almost tasted like I’d sprayed it with Windex, which was weird because a second ago, it had seemed normal to me. 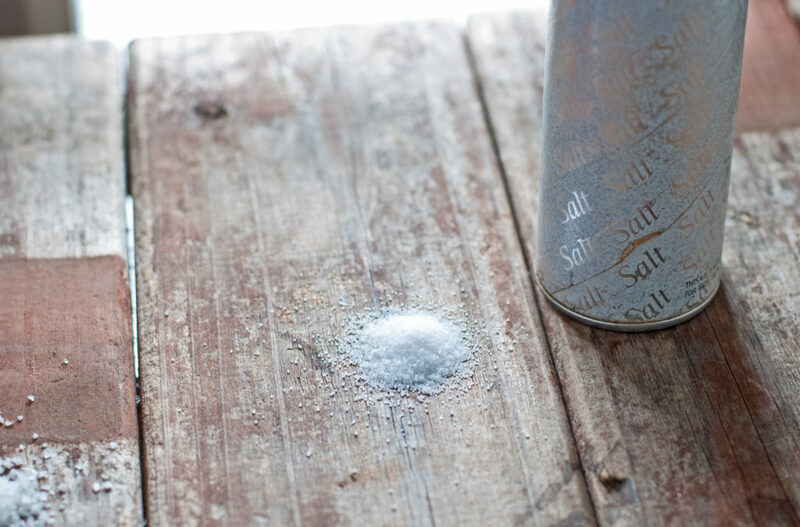 Fleur de Sel isn’t just “salty,” although it is. It’s almost like putting granules of flavor on your tongue. I tried sprinkling a few grains overtop of a roast, just before serving. The taste of the meal was out of this world– the granules somehow elevated all the natural flavors of the meat, without making anything taste excessively salty. It was like putting on mascara– your eyelashes were already there . . . but BOOM and WOW! Now they come to play. So in honor of this delightful Fleur de Sel and its “Caviar of Salts” title, which I now know is well earned, we are going to make some Salted Caramel French Macarons today. Because, you know . . . they’re French too, so . . . *sniffs. 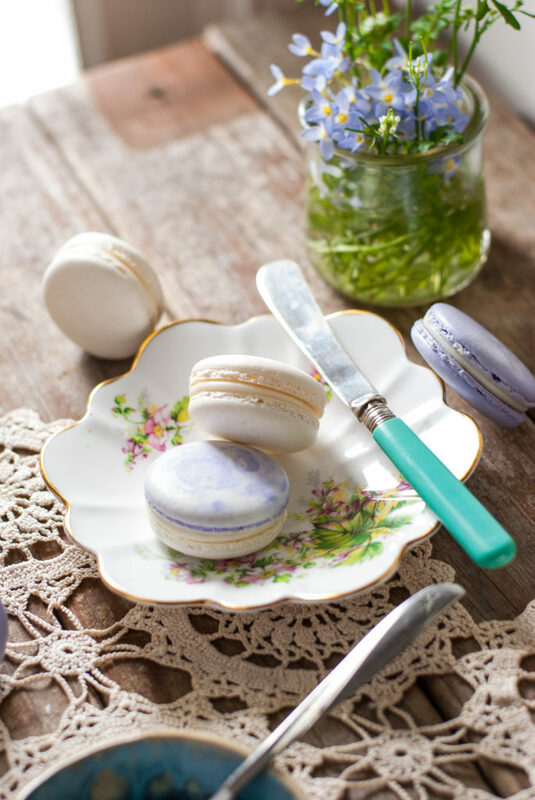 * We have already gone over how to make macarons, here . 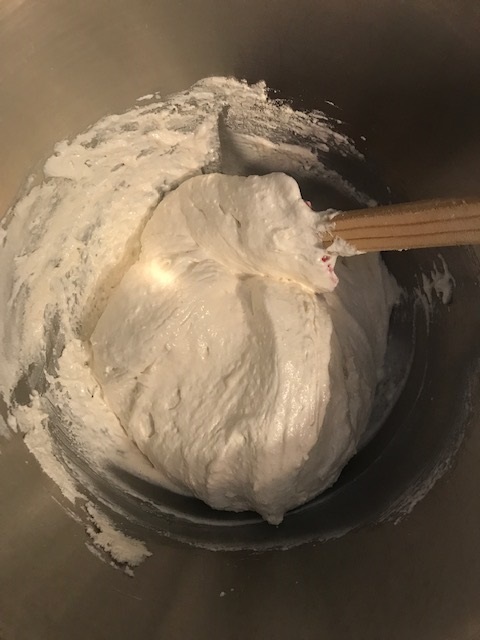 . . so this will mainly be about the filling, and how to use Fleur de Sel (or any other salt that you prefer) to accent, rather than overwhelm, your caramel filling. 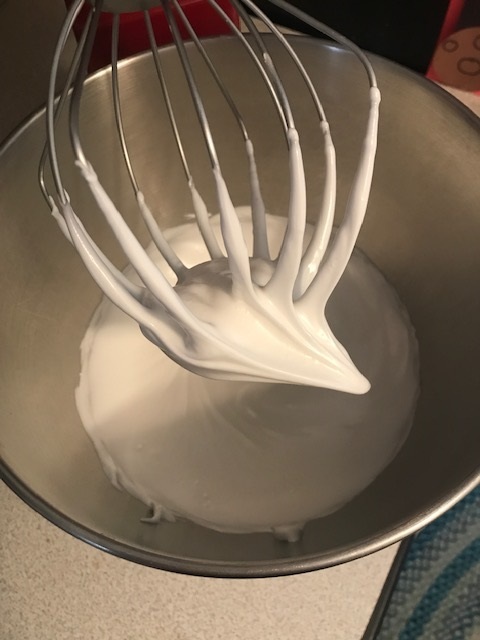 So as we learned before, you beat your egg whites and sugar to stiff peaks . . . 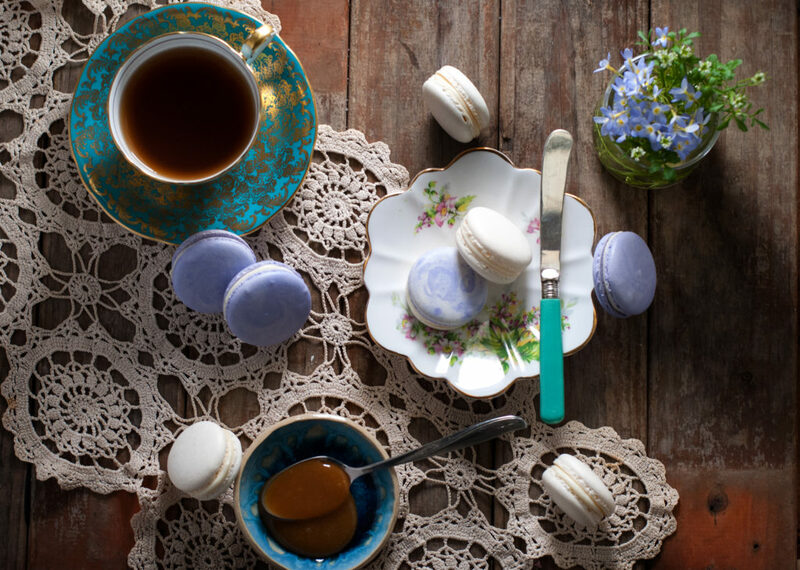 Incorporate your almond flour/powdered sugar until you reach proper macaronage . . .
Bibbidi bobbidi boooooo, the shells are rested, baked, and cooled. (Don’t you love how fast it goes here? haha). 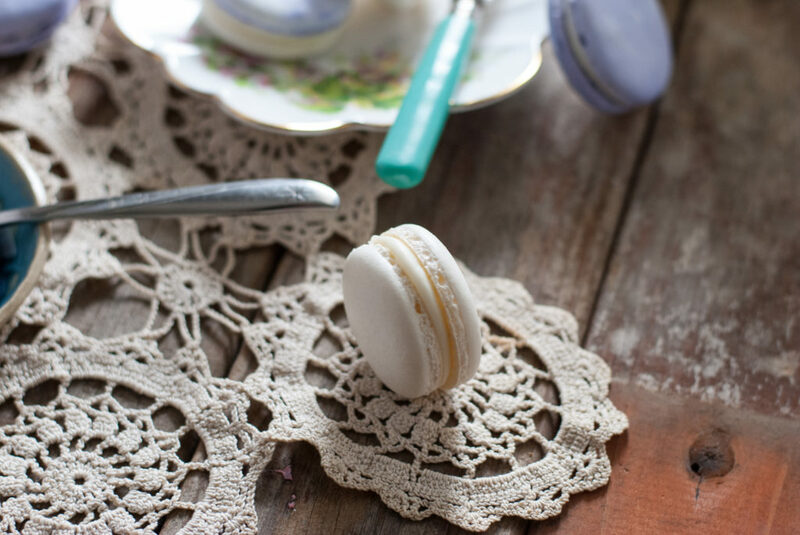 Again, if you need further guidance on how to make macaron shells, check out my much more detailed post here. 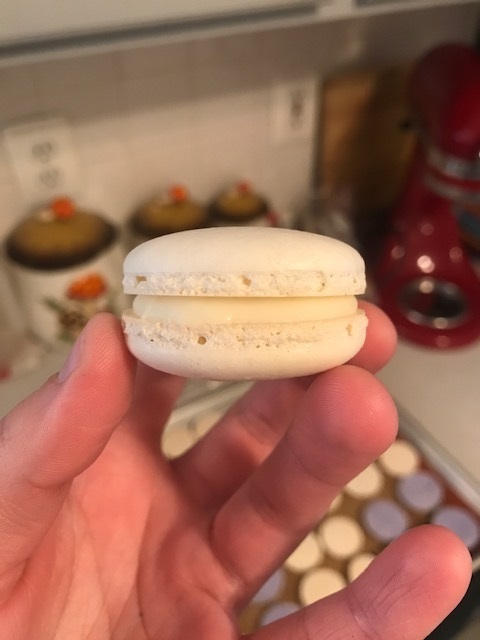 The reason I’m even showing you these macs is that I want you to realize how versatile, and yes (*hides eyes in shame*) gourmet salts really are. Throw a few grains on your deviled eggs this year at Easter and see everyone’s eyes pop open with delight . . . “What did you put in these? They taste amazing! Something is different this year but I can’t put my finger on it . . .” Fleur de Sel has kind of become my “secret ingredient” for everything, now. I throw a few grains on meat right before serving, pop a few on top of a rich chocolate dessert that needs a little “something something,” and even gently sprinkle a few granules overtop of soup when serving. A few grains go a long way. It doesn’t take much (which is good, because it’s way more expensive than salt has any right to be, without a pedigree and papers, which, I guess, *she admitted grudgingly*, it kind of has). 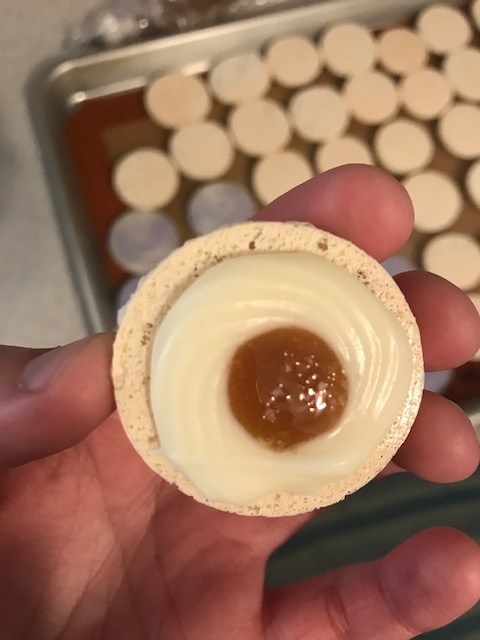 I used a whipped white chocolate ganache to surround the outer circle of my shells (to hold in the more runny caramel). I find that when I use caramel by itself, the macs are too messy to eat. The white chocolate will harden in the fridge and create a “dam” of sorts, to keep the caramel nice and cozy inside, just waiting for you to enjoy it. So . . . ganache dam. Pool of caramel loveliness (I just used a purchased caramel sauce, but you can make homemade if you prefer), then 3-4 flakes of Fleur de Sel on top of that. Gently place the top shell over everything. Voila. You just made a flavor bomb. To be the perfect crispy/chewy consistency, let these little guys sit in an airtight container in the fridge overnight. The 24 hour “curing” will make them perfect. They should be an almost “nougat-like” consistency, with the filling seeping a little into the shell, and the shell accepting some of the flavor of the filling. 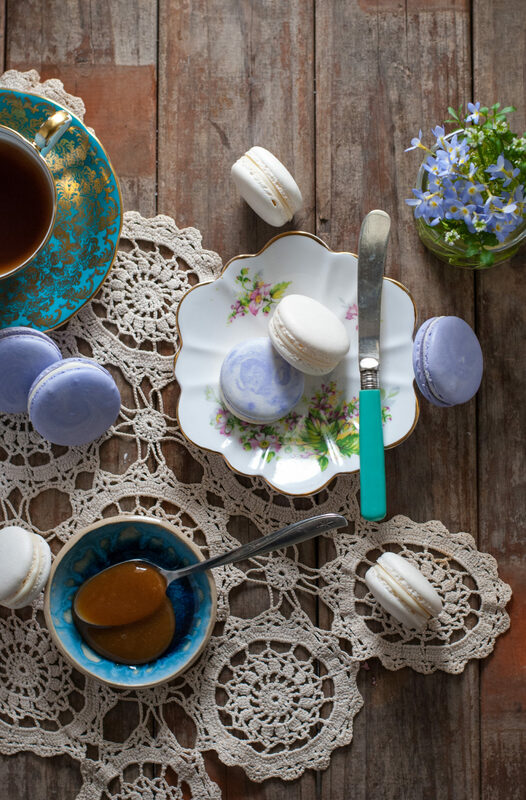 Sitting in the fridge also gives the white chocolate dam a chance to firm up, making sure that if you turn them on their sides for serving (such as displaying on a macaron tower), they won’t leak little salty caramel tears. 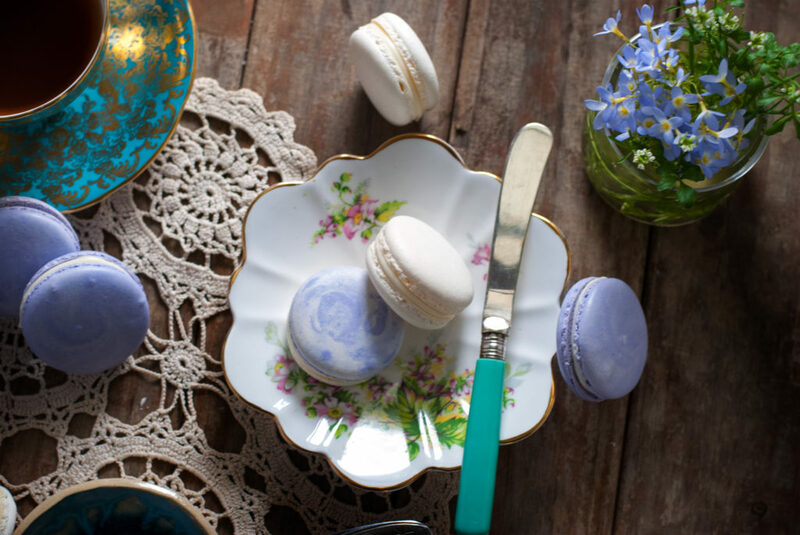 Because that would be terrible, and I don’t think they make tiny little French kleenex for macarons. Don’t make the sweet babies cry. That would be terrible. After 24 hours in the airtight container in the fridge, these babies are ready to explode their flavor bombs into the mouth of some lucky person. That sounds weird. But you get the idea. They are delicious, primed, and ready to roll! And because you are good little students, you let the white chocolate ganache harden in the fridge, so now you don’t have macaron filling leaking all over creation when you lay them prettily on their little pastel sides to look pretty for a photo. You’re so smart. I love working with you. I am a firm believer in little moments of solitude to re-center yourself on a busy day. These little beauties are perfect for the 5 minutes of self-care time that we all need (and very seldom get). 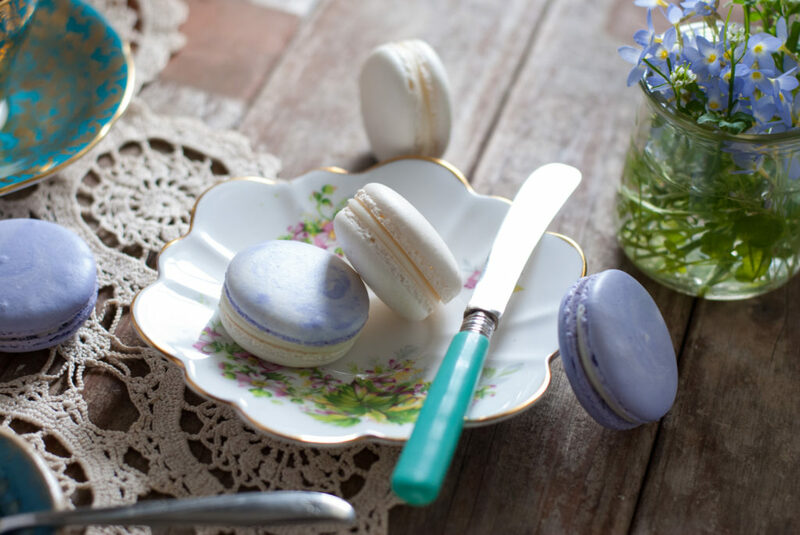 Make yourself a steaming cup of coffee or tea, and put a few of these pretty, pastel lovelies on a pretty plate. Sit by a sunny window. Take deep breaths and think about life. Think about how far you’ve come, and how you are still hanging in there, no matter what has come your way. Give yourself a pat on the back and smile. How did you get so smart?!?! Your blog is very well written. Informative and funny. I really enjoy your stories. Lovely.